Wireless networking is one of those things that we all have come to rely on. We tend to expect to be able to connect just about anywhere now. I mean, even McDonalds has wireless now so why shouldn’t we? But what do you do when you come across one of those places that either does not have it, has poor quality (like many hotels) or you are just concerned about your security when on those open networks? 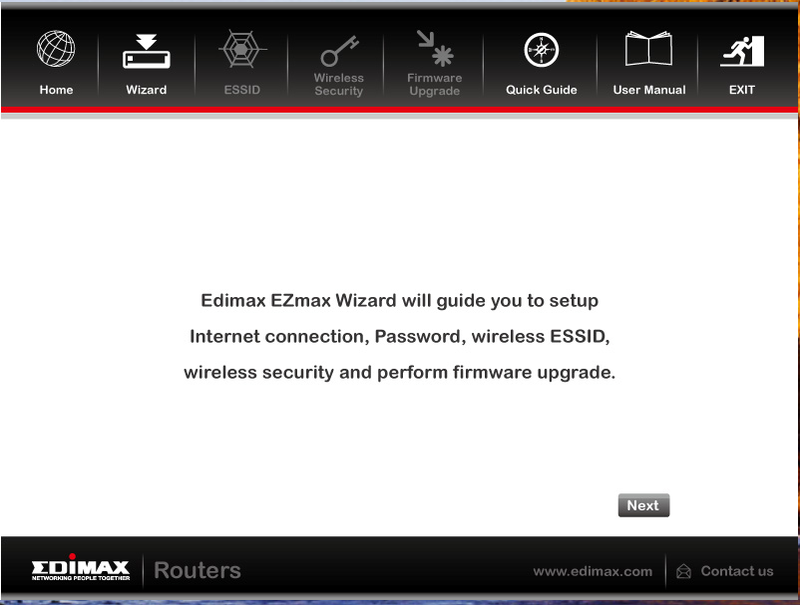 Well there are a few companies that have a solution to this and we are going to take a look at one from EDIMAX today. 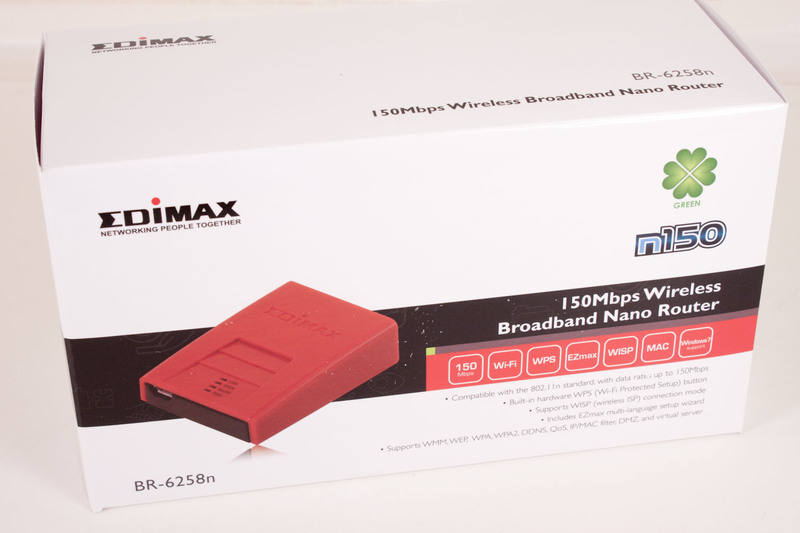 It is one of the world’s smallest 802.11n wireless routers the EDIMAX BR-6258n. 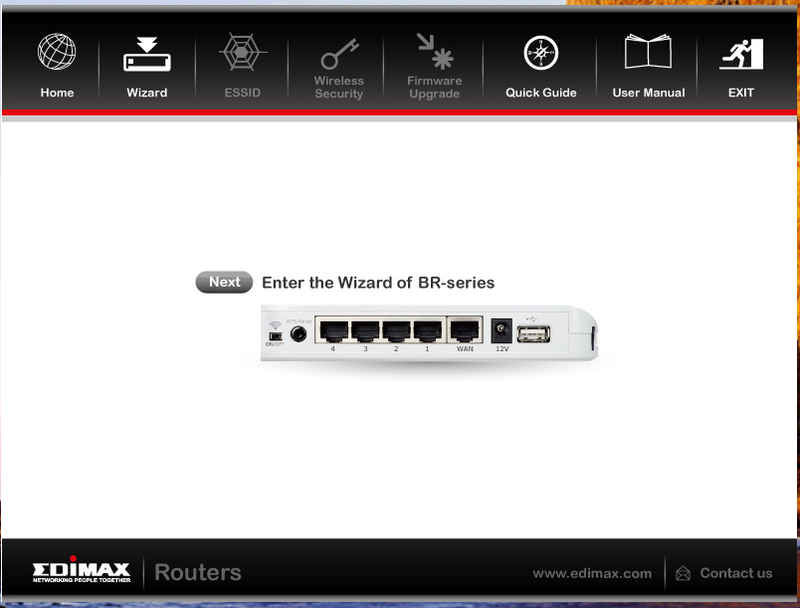 The box for the BR-6258n is an odd size for a router. It is rectangular in shape but does have more than enough images and logos to at least let you know what you are getting. I will say that the picture of the BR-6258n is not what you would expect. I took the box and showed it to a few people and they were quite surprised at the shape of the device. The back of the box (if you can really call it that) is simple with a diagram of how you can fit this into an existing network. 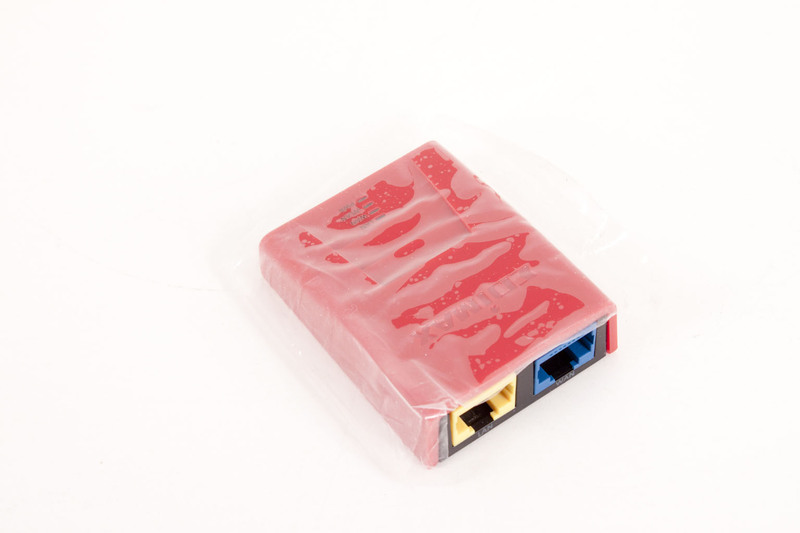 This includes using it to connect to an existing wireless network in pure wireless mode. This is the thing that we are really excited about. 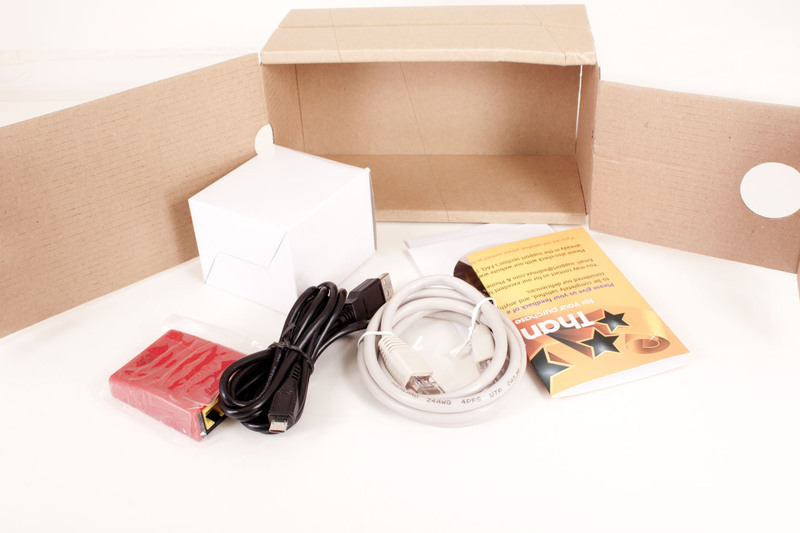 Inside the box is the typical assortment of items you will need to get things working for almost any environment. 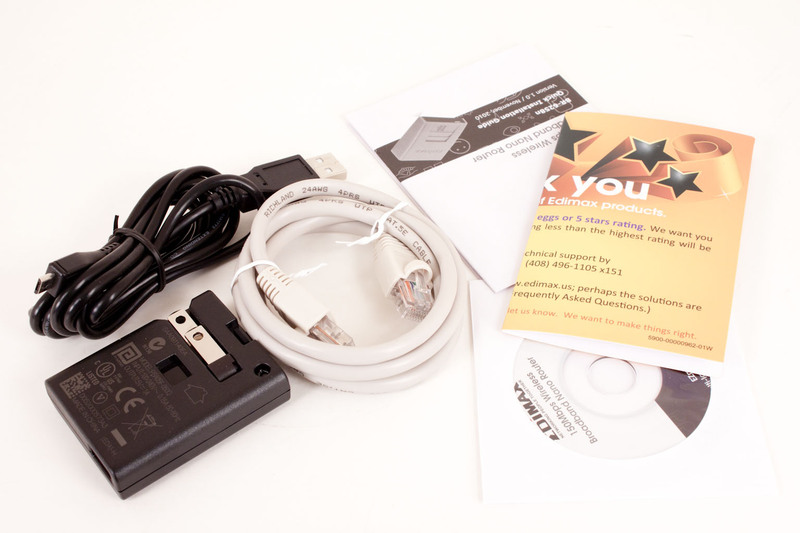 You have a USB cable along with a wall power block, an Ethernet cable, drivers mini-CD and a small instruction poster. The USB cable allows you to power the BR-6258n off of a laptop so you do not even need power to run this. As I mentioned above the BR-6258n is an odd looking product. It looks less like a router and more like a wedge or shim; something that you would put to even something out and not a piece of networking gear. The fact that it is bright red does not help either. In keeping with its Nano tag the BR-6258n is very small (as you can see in the picture with the US Quarter). There are four LEDs on the front that let you know status (power, LAN, etc). 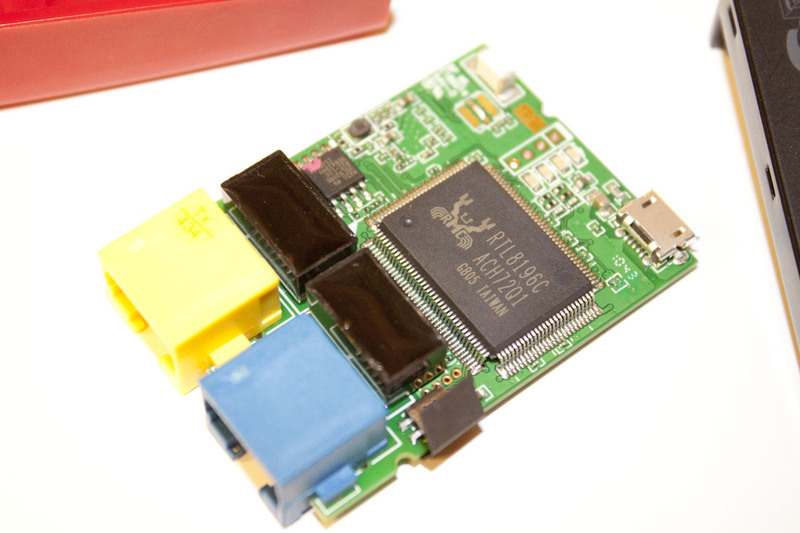 On the flat front end is a small micro-USB port. 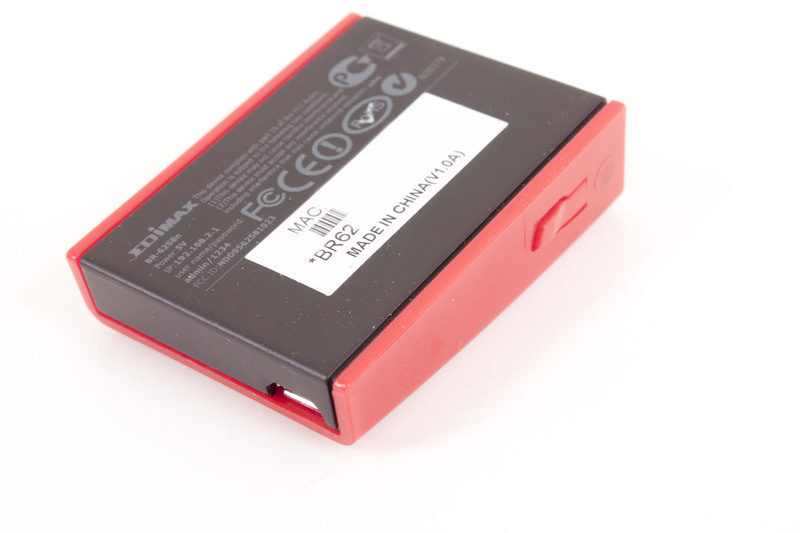 This is your power connection and can be used with the power block or with a standard USB port on a laptop (if there are no power outlets handy). 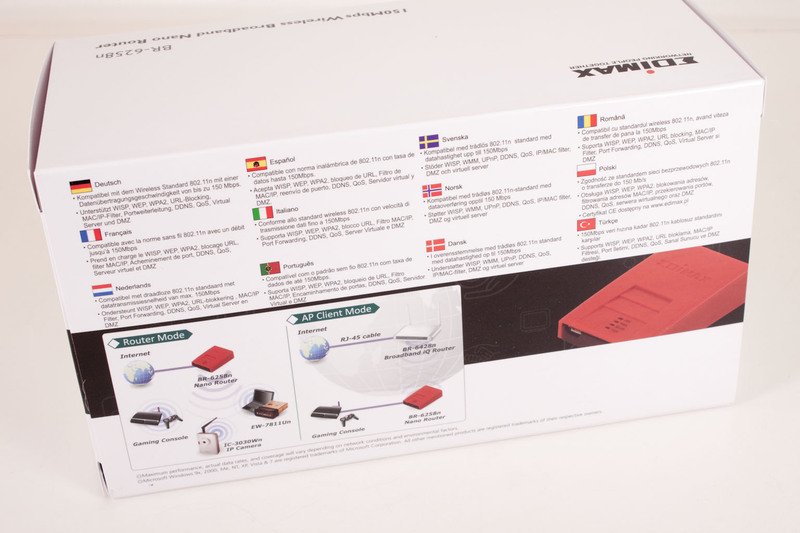 The back of the BR-6258n has 2 RJ-45 ports; one for the Internet (or the LAN you are connecting to but want to be safe using), and one for your computer. The bottom is a plastic base that has the default information on it (in case you forget). We decided to break open the BR-6258n just to see what was inside. The top cover can be removed with a small flat head screw driver (or a fingernail if it comes to that). Once that is off you can pull the hardware out of the bottom tray easily enough and see what you have. Under the hood we find a Realtek RTL8196C This chip is a 5-Port 10/100 controller and is used for internal switching (both LAN and WLAN connected systems). 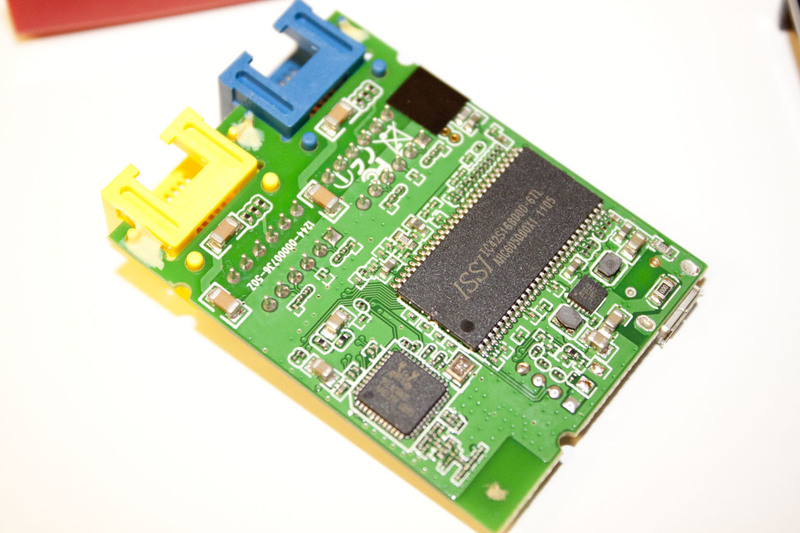 Attached to this (and on the other side of the board) is an RTL 8188CE wireless LAN controller. 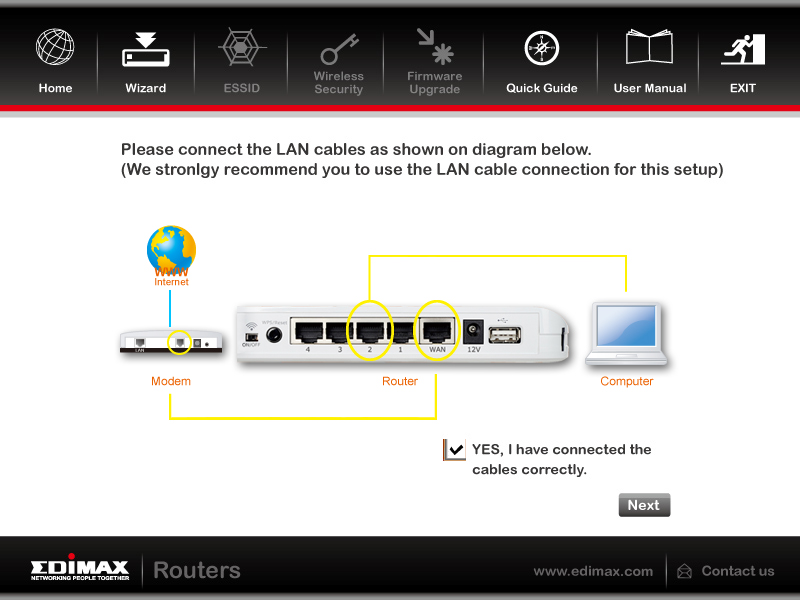 These two combined together make up the connectivity of the EDIMAX BR-6258n. 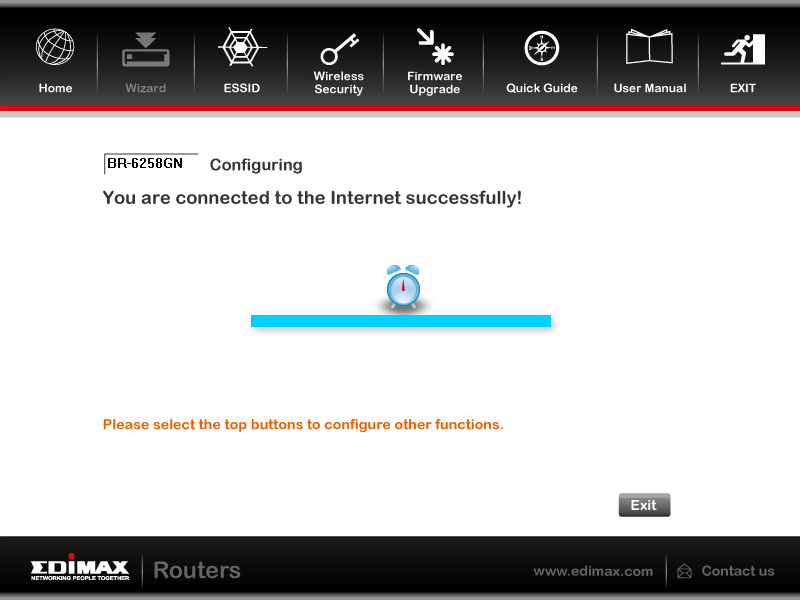 The BR-6258n should have the right internal components to give us decent performance so let’s take a look at see what sort of features and controls EDIMAX has given us. To set up the BR-6258n you can take one of two routes. The first is also the most simple; all you have to do is drop in the Mini-CD-ROM and either let the AutoRun go or click on the EZmax.exe application. When you do the setup application will start and ask you which language you want to work in and after two or three screens you are off and running. 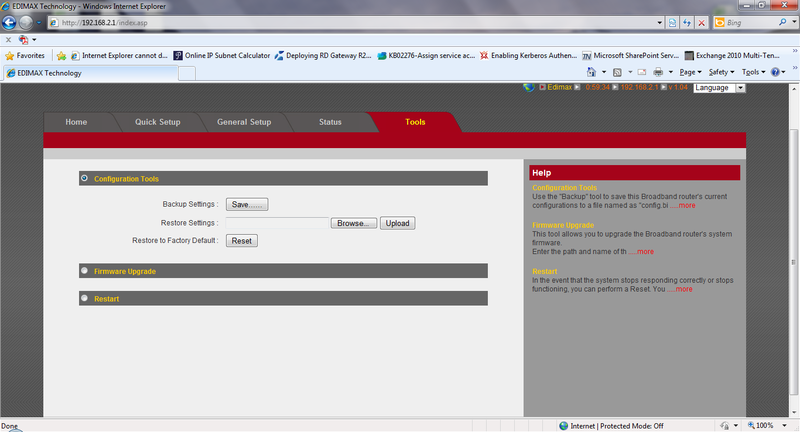 One of the first things you have to do during the setup is to change the admin password. This is a great step, but they really should update the information about how to reset the router if you forget the password. The Setup says press the button for 3 seconds to reset… well all that will do is put you into the WPS (wireless protected setup) mode. If you REALLY want to reset the password you have to press and hold that button for more than 20 seconds. On the next page you get to choose the type of Internet connection you have. 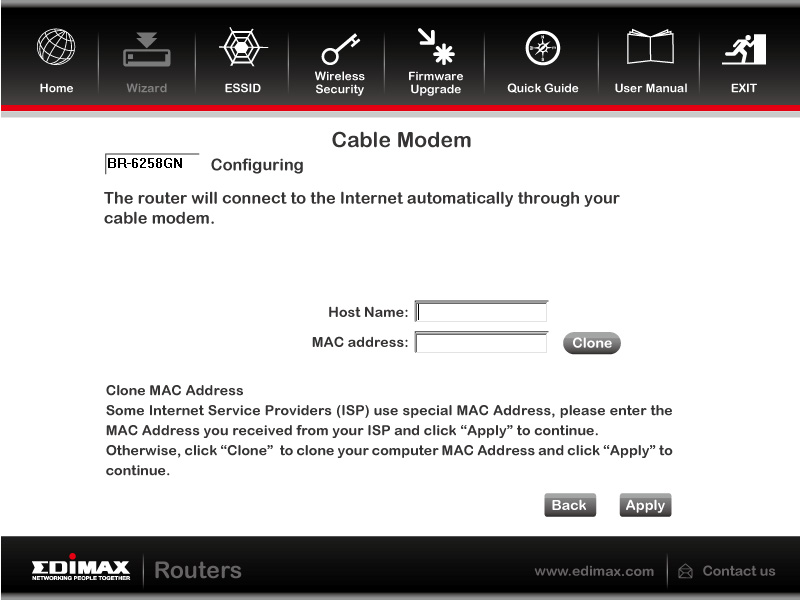 When you chose this option it will ask you for a Host name and MAC address, these are optional so you do not have to worry about them unless your provider has MAC address restrictions. After a few seconds of testing and configuration you are on the net. 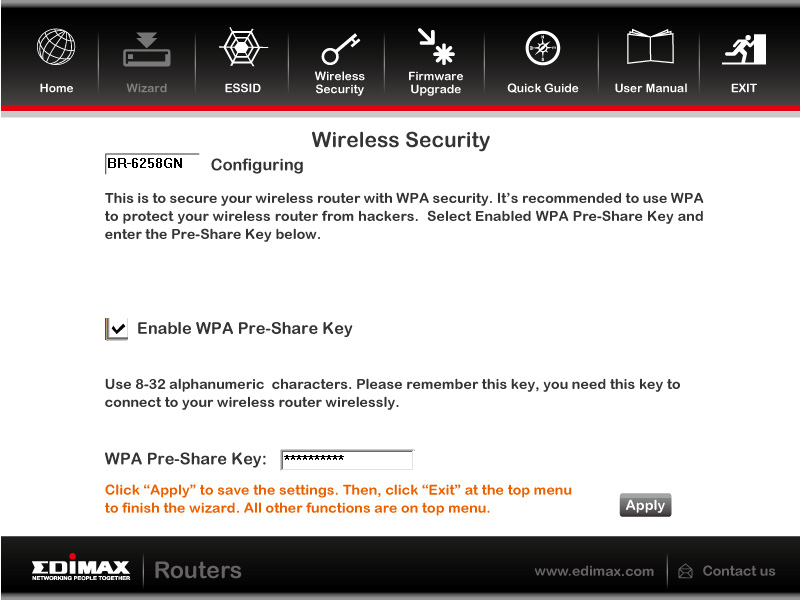 The next items that you should configure are the Station ID (ESSID) and the Wireless Security settings. Leaving these at default can leave you open to attack (especially if you do not enable security on your wireless connection). 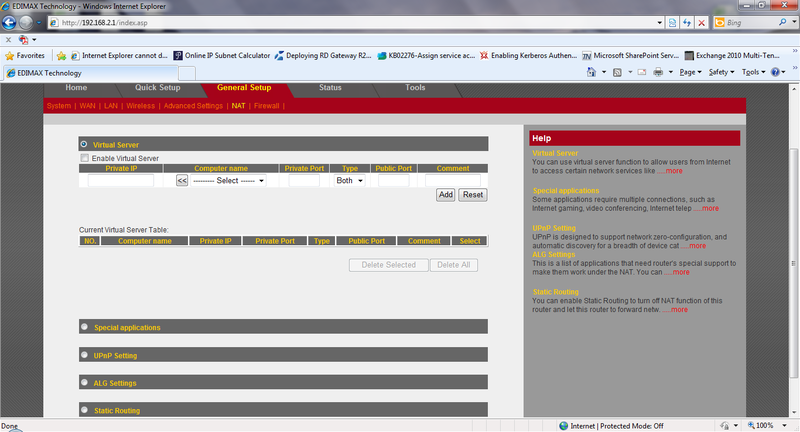 But as you cannot configure everything in this application we will have to head into the WebUI to complete our setup. The BR-6258n has a well put together UI that is surprisingly full featured. When you first hit the WebUI you will come out on the Home Page. This has information about the Internet, Wireless, and other items. The next page is the second method of setting up the BR-6258n. 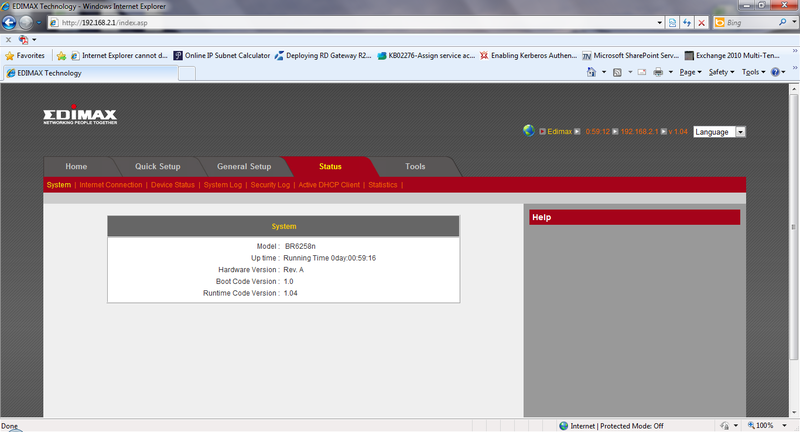 This is the quick setup Wizard and is similar to what we went through with the one on the CD-ROM with the exception of starting off on the time zone page. 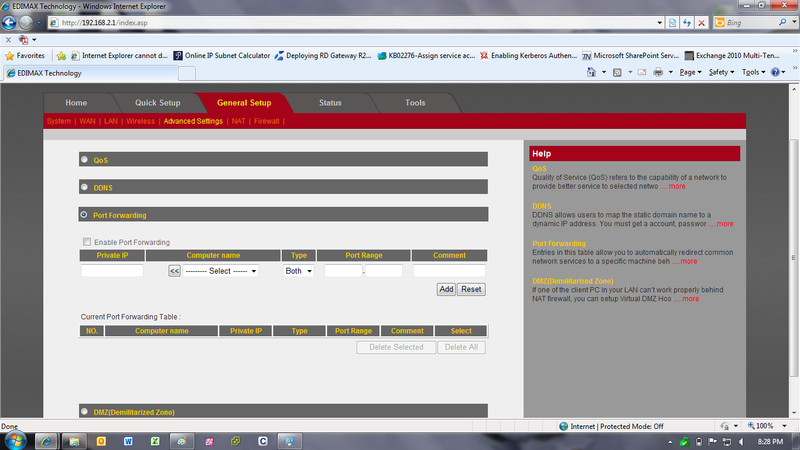 On the General setup page there are quite a few nice options. We will start off on the WAN page. 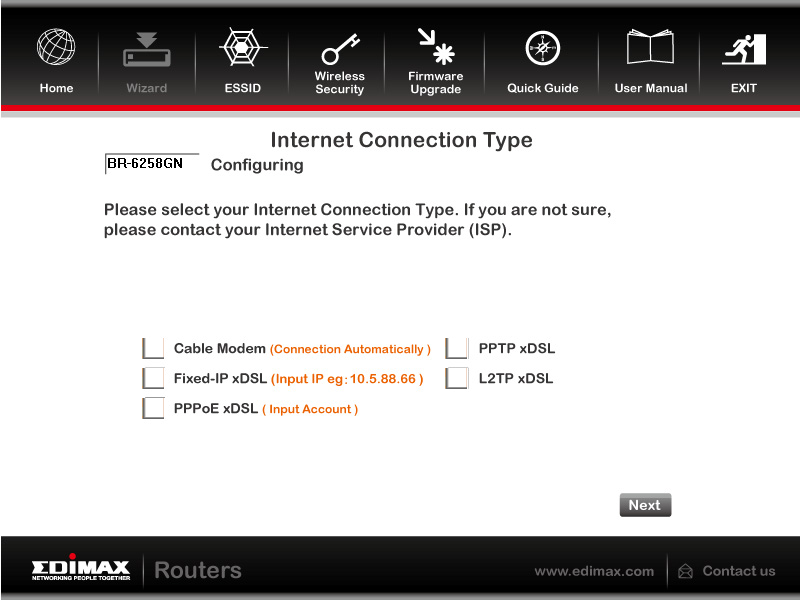 Here you can manually configure the type of internet connection that you have as well as the Wireless ISP set up. 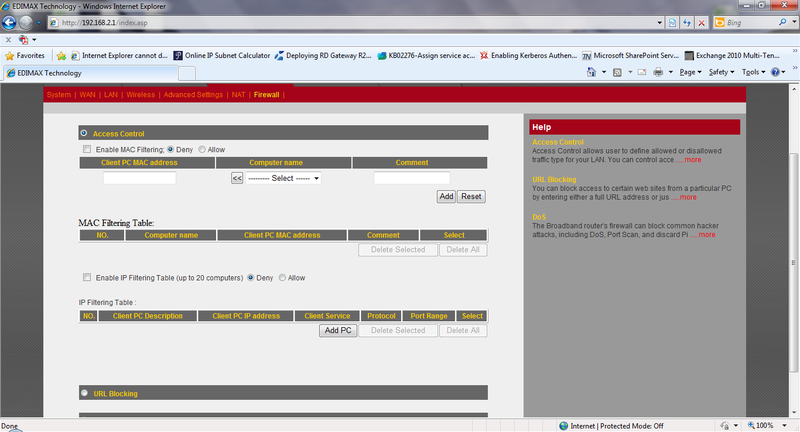 When you chose this option you can connect to a wireless access point and use it as an ISP. This is great to those public free wireless zones when you do not want to leave yourself open prying or malicious others. The LAN page is what you would expect, information about the LAN and also about the DHCP service that the BR-6258n has internally. Surprisingly you can even setup Spanning Tree Protocol for this device. 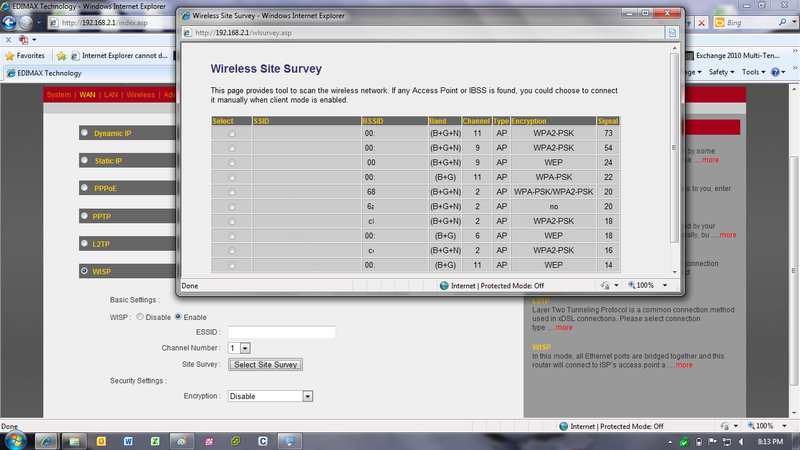 The wireless page gives you the usual options and so extra modes if you are interested in setting these up. One of the more interesting is the bridge mode (similar to WDS but perhaps a little more overhead). 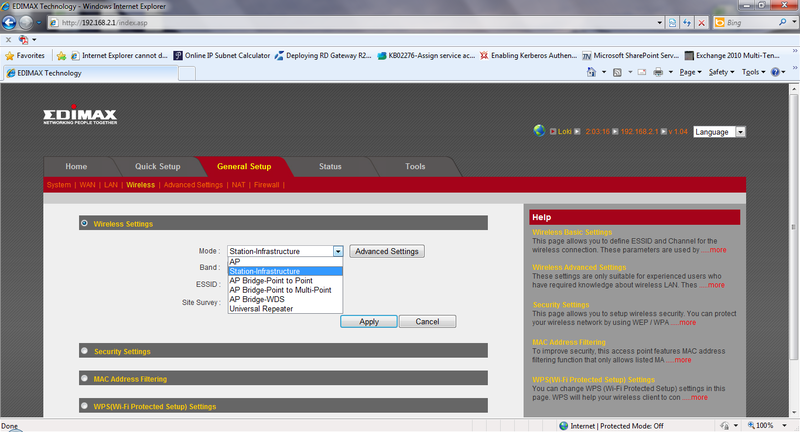 You can setup single point to point or single point to multi-point. 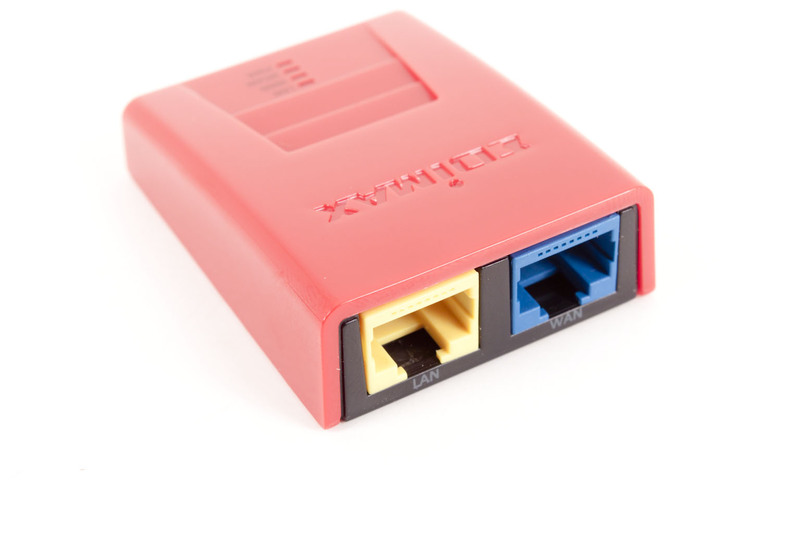 To do this you will need the MAC addresses of the devices you want to connect. The Advanced Settings page is something else. You can actually setup Quality of Service on this thing. 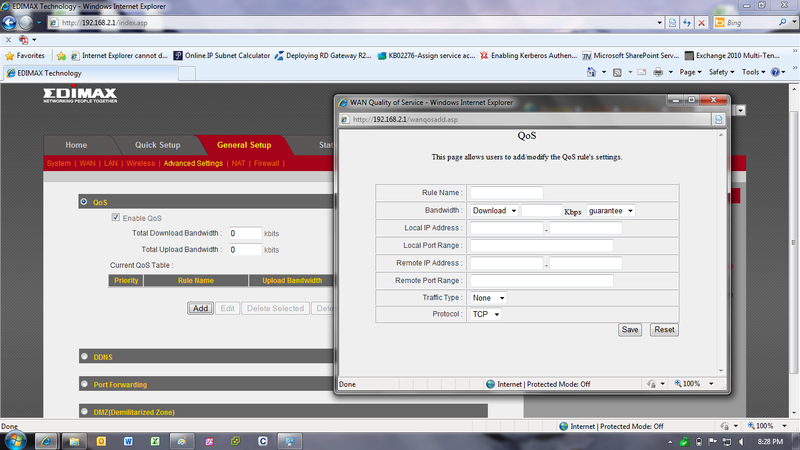 And not just simple stuff either you can actually add in QoS profiles that will allow you some great freedom to control the traffic that you put through the BR-6258n. 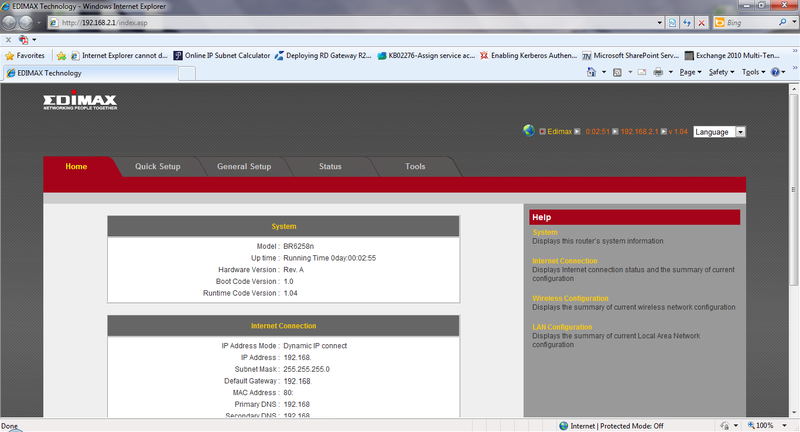 Under this page you can also setup port forwarding, and a DMZ if needed. 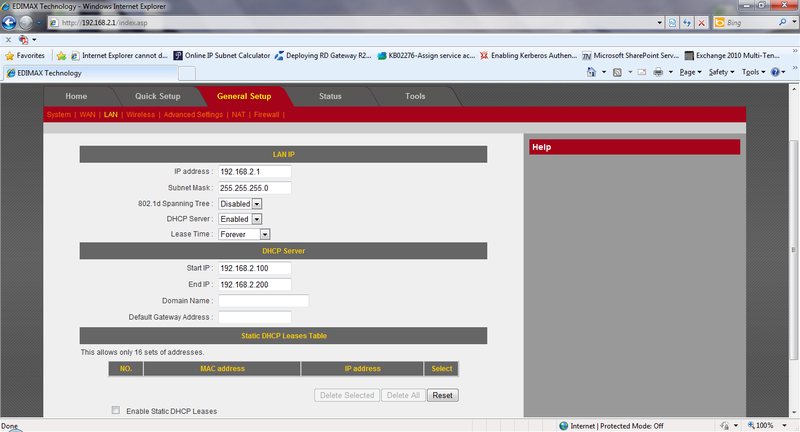 The NAT or Network Address Translation page has features that allow you to configure the routing of the BR-6258n. You can setup virtual servers (if you needed something always sent to a certain system inside the firewall), Static Routing, ALG and Application exceptions are also available. 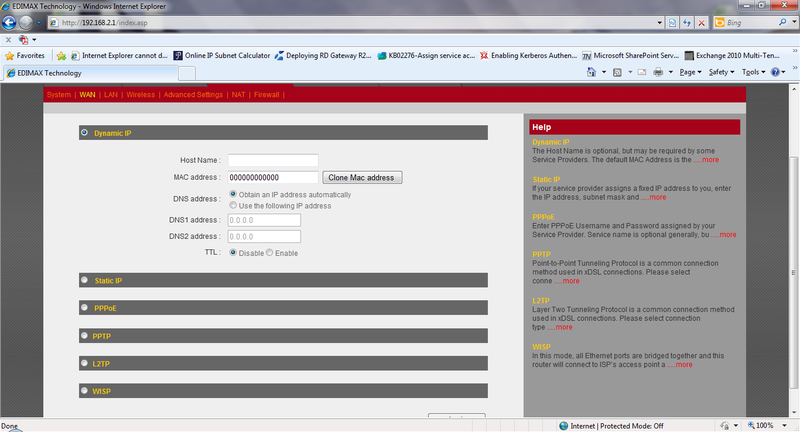 The Firewall page is a little lighter than we expected, but still has enough to keep things secure. 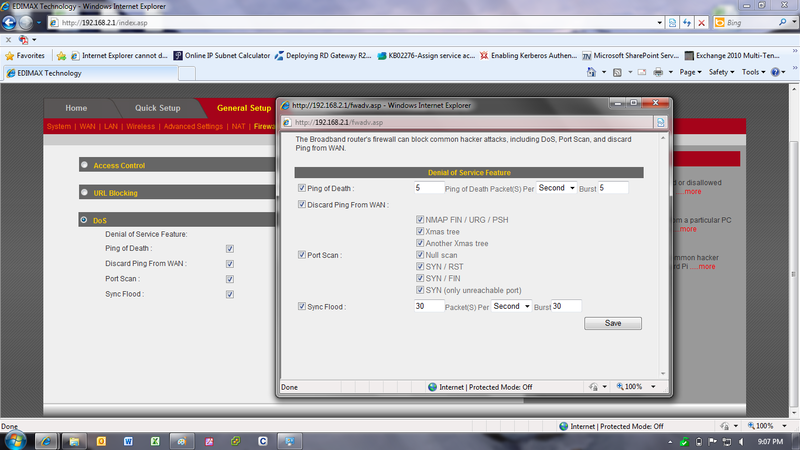 One of the things that I did find especially nice was the advanced options for the firewall. 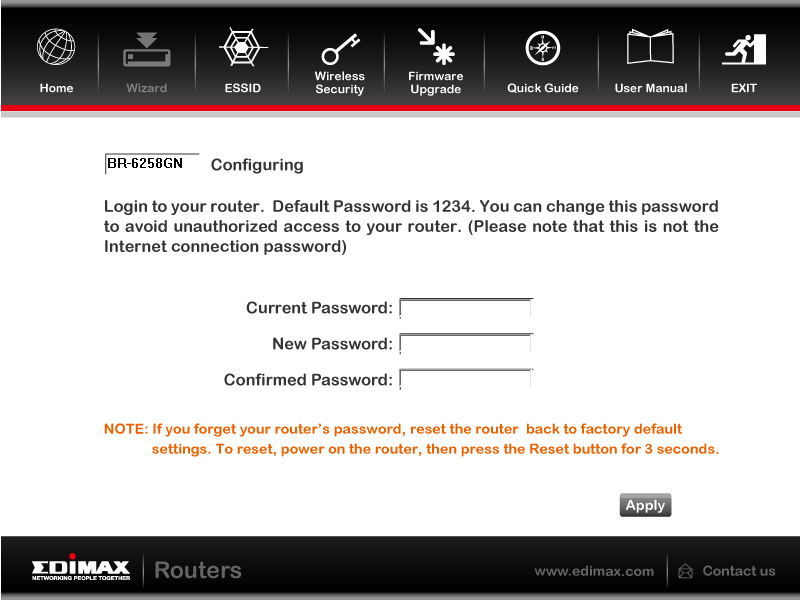 Although the BR-6258n would primarily be used as a mobile router for travel or use in a non-secured area EDIMAX has added in some nice DoS preventative features. The last two pages are pretty basic and not much to talk about. The performance of any wireless device is going to have multiple parts, just like any type of hardware. We are going to take a look at the ones we feel are the most important to consumers. The first is simply raw performance. To test the BR-6258n we ran it in multiple configurations to ensure that we covered the spectrum of possible performance. 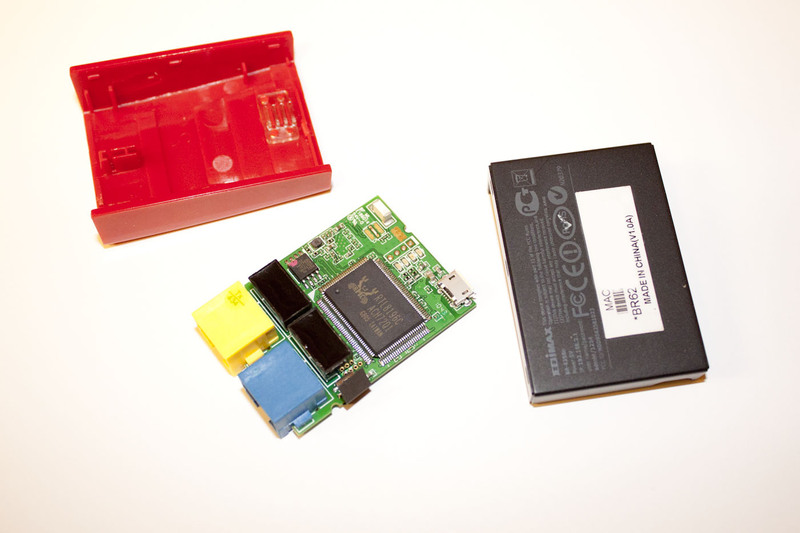 We ran the BR-6258n in wired mode, wired to wireless and wireless to wireless. 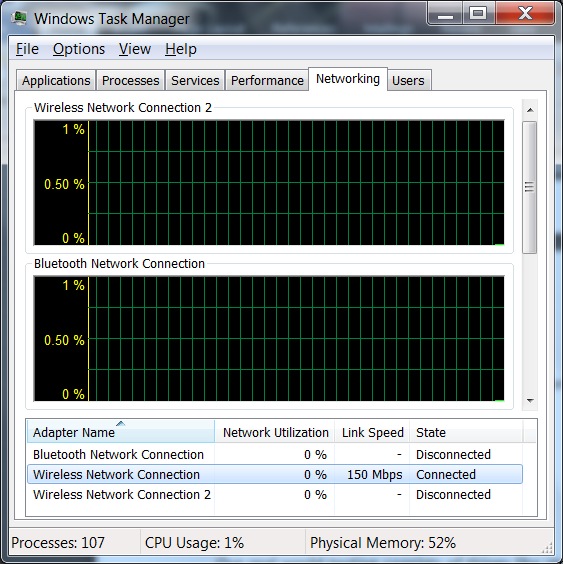 With each of these we tested basic throughput and how responsive the network “felt”. Our experience with the BR-6258n was good. It was not the fastest router we have tested, but it was more than sufficient to get the job done. We were even able to do quite a bit of gaming with this file transfers were decent and we found that we could move files around without too much difficulty. This was very surprising. We were able to reach quite a few wireless access points with decent signal strength that are not always visible to the internal adapters on our test laptop and the Asus EEE Slate we now use for testing. The box says 150Mbps and surprisingly that is what we got. We are used to smaller devices like this getting a little less than what they advertise but for both wireless connections we were able to maintain a solid 150Mbps connection. We do want to mention that when we ran n Wireless to the LAN port we lost some speed, you are dropping from 150Mbps to 100Mbps as the RTL8196c cannot handle more than that. Our real world testing consists of things like streaming movies (from Netflix and a NAS device), moving large files (a folder with 20GB of pictures) and a video file, web browsing and of course some gaming. As we mentioned above we had no issues at all over the wireless or wired connections. We did notice a slight speed decrease when running wireless to wired but was due to the Ethernet controller in the BR-6258n. One of these days we will finally see one of these with a full GBe switch in it. Maybe when someone builds a 450Mbps version we will get to that. Value is another very subjective topic. What is expensive to some might be a deal to others. You can look at this topic in multiple ways. One is raw price and the other is what you get for the money. Each is accurate and both are correct ways to look at price/value. We tend to look at features, performance and real-property when we discuss value. However, we also take into account the raw cash cost of the item. The BR-6258n runs for $40 at many e-tailers. This is an awesome price for something this flexible. You are getting a multi-mode wireless device that comes complete with a switch, firewall and can fit into your pocket with room to spare. All in all that is not a bad deal. 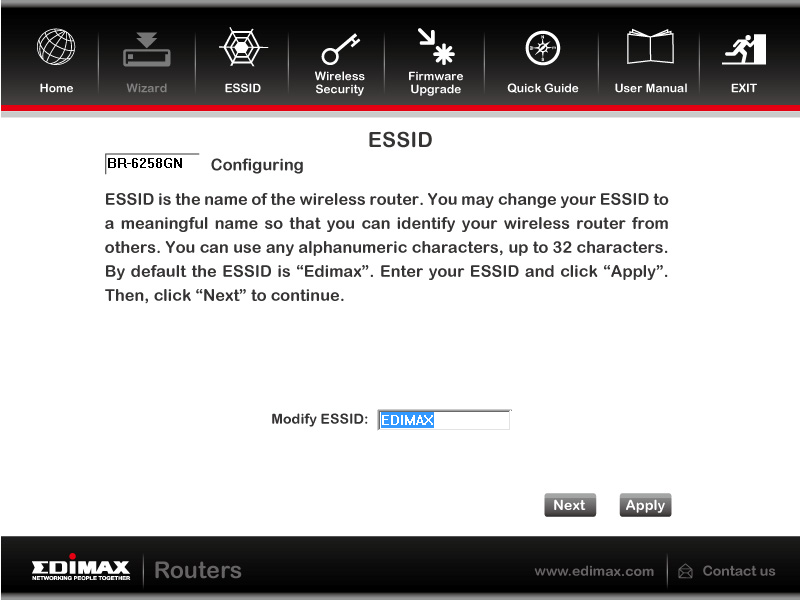 The EDIMAX BR-6258n Nano Wireless Router is an impressive product although truth be told you would not know it if you just picked up the box. You really cannot get the full appreciation for what you are getting until you get this plugged in and working. We had quite a bit of fun taking this around and using it in places where there was free wireless (including the guest wireless at work). We were able to be on these networks with a feeling of security (although we are still always careful). 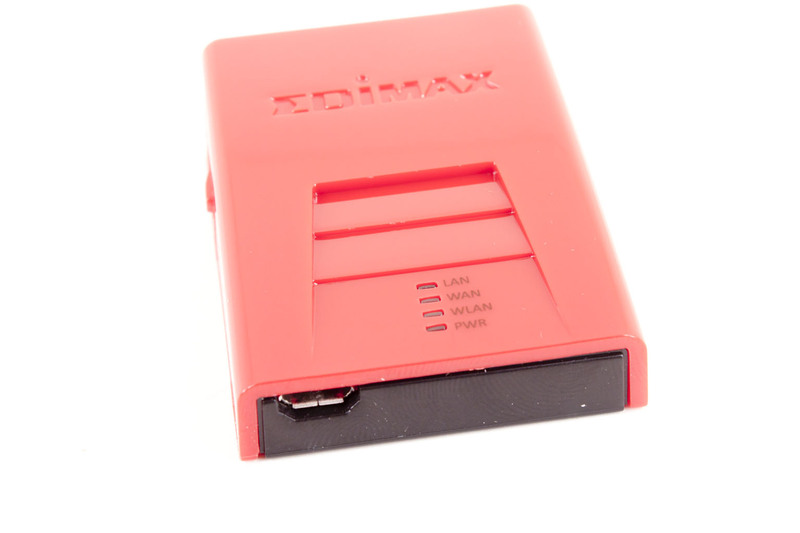 EDIMAX does need to update their documentation and they also might want to consider shipping with some sort of carrying case or adding a decent battery to this. The former is absolutely needed while the latter would certainly make a very nice touch. 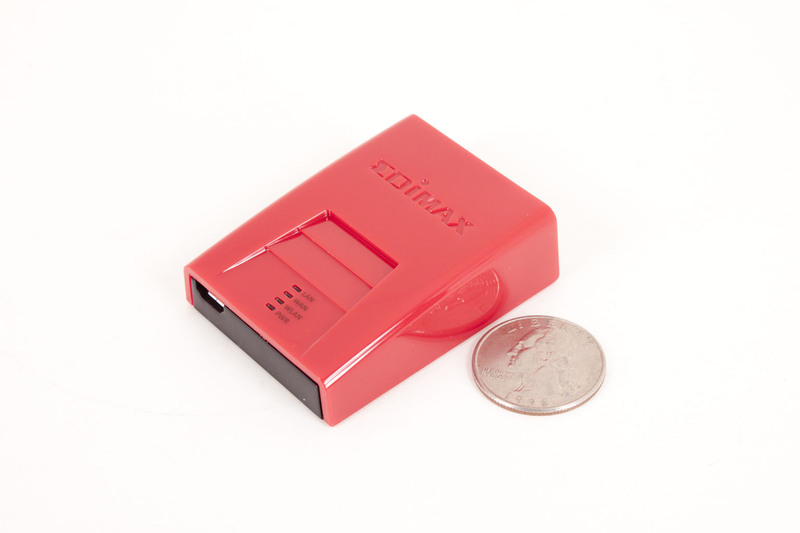 If you travel a lot and are looking for some protection (besides the horrible software applications that are out there) from unwanted prying or attempted intrusions then you will want to take a look at the EDIMAX BR-6258n and make sure you have $40 or so handy as we are pretty sure you will want to buy one of these when you do look.